Review Context: I’ve been playing Rogue-likes ever since The Binding of Isaac was released and it’s one of my favorite and currently most played genres. 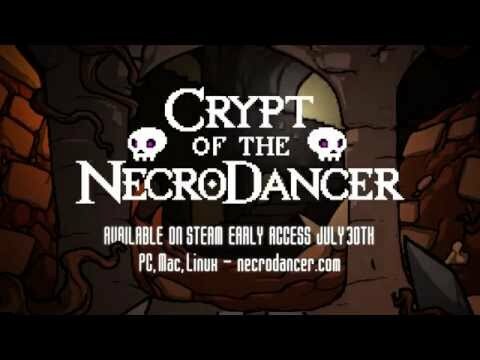 I’ve had Crypt of the Necrodancer since it went into early access on Steam. I’ve fully completed it twice. Many times a game has come to life by asking, “What if we take this genre, and that genre, and mash them together?” Though always unique, rarely does this method produce a top shelf game. But one day the stars aligned and the world was given the gift of Crypt of the Necrodancer. A rhythm based, rogue-like, dungeon crawler that’s executed near to perfection; simple, fun, and exciting, with everything a great rogue-like needs, not to mention an awesome soundtrack. So jump in the dungeon and step to the beat, for there be monsters here to defeat. 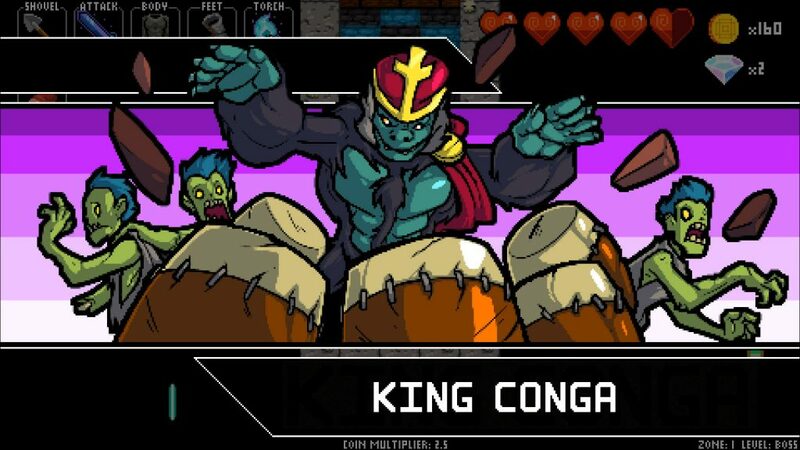 When the words “rhythm based dungeon crawler” are used to describe a game, thoughts of scrolling arrows and crowd meters are what come to mind. That’s the kind of genre mash up that while neat, never really amounts to much. Its not enough to take two ideas and smoosh them together, they have to be melded and combined into a new idea. Crypt of the Necrodancer is played with only the arrow keys. Every action must be performed on the beat and all enemies also move on the beat. The penalty for missing a beat is that the desired action is not performed and essentially all the enemies get a free move. What makes this fun is that keeping the beat isn’t necessarily the hard part, it’s reacting to your surroundings as they rapidly change. Trying to analyze enemy’s movements is easy, trying to keep a beat is easy, for some people, but trying to do both can get quite difficult. It’s a sort of difficulty that I haven’t seen in a game before, and makes Crypt of the Necrodancer special. It messes with your head, trying to think about how a particular enemy moves and deciding what your going to do all in the time of one beat. Start trying to take on multiple enemies at the same time, and the flashing lights get real confusing real quick. It’s so easy to make one wrong step and then not be able to pick up the beat again before you’re ripped to shreds. On top of that, as you go deeper into the dungeon the songs get faster, so the time you have to think gets even shorter as well as the enemies getting stronger. But once you figure it out, and your knocking em’ down left and right, you get that satisfying feeling you get in Dark Souls when you beat a hard boss. That feeling of triumphant euphoria you get because it is hard but also fun. It’s just satisfying to do well, like playing the right notes on a guitar, but without being frustrating because there is very little downtime. While some rogue-likes likeThe Binding of Isaac get most of their fun from late in a run where all the items acquired have combined to form something cool or powerful, Crypt of the Necrodancer‘s fun begins as soon as the track starts. The head banging jams of the original and stellar soundtrack and its colorful pixel art are fun and energetic. 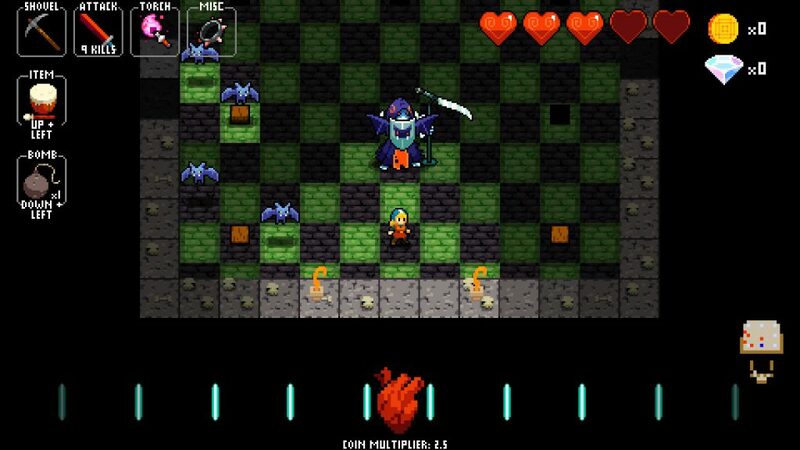 The dungeon comes alive with all the monsters hopping in time and the disco floor flashing. Even the actions you take add to the music. Shoveling dirt and smacking ghouls add their sound effects to the song making it a joy just to play. You can even add your own custom music to the game so it never gets old. The runs are short only taking about 10 minutes, provided you last that long, and apart from a surprisingly long initial load time, there are no loading screens. Once the music starts, it doesn’t stop and neither does the fun. Crypt of the Necrodancer’s items and upgrades are unlocked by collecting gems during runs. Once an item is purchased it will begin to show up in the dungeons. The harder the dungeon, the more gems you find, but before you can enter a dungeon you have to relinquish all the gems you got on the last attempt. So to get the most powerful items you have to have good runs and get lots of gems. You cant just save up small change by playing a lot, though there is usually something cheap you can buy if the run ended short. it wouldn’t be as fun if losing got you nothing. There are only four dungeons to delve, but there are ten characters with unique playstyles to unlock and play that each have to get all the way through themselves. 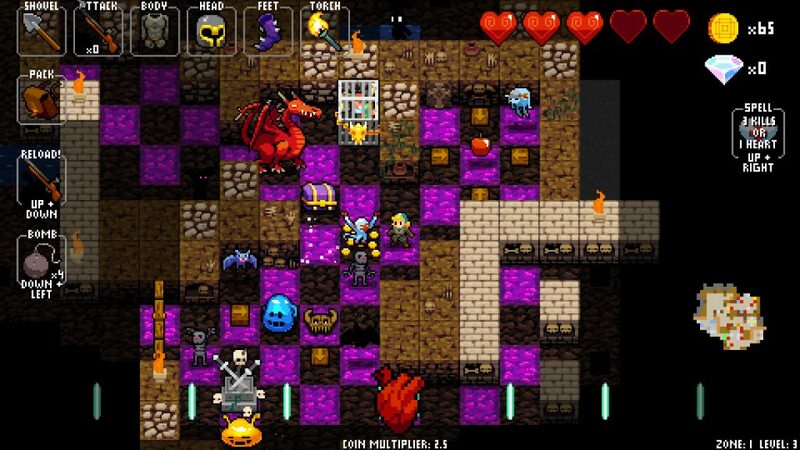 In addition, a daily challenge and a super run that encompasses all the floors together, giving Crypt of the Necrodancer plenty of content to satisfy the need to necrodance. Crypt of the Necrodancer doesn’t have many items. There are rings that do some interesting things, but mostly it has a set of equipment that follow different arch types; iron, titanium, blood, and obsidian, to name a few, all do different things. You don’t always find the same things, but nothing crazy happens like in The Binding of Isaac or A Wizard’s Lizard. The real draw is the gameplay, which is difficult enough without everything radically changing. Items can be found in chests, given by statues, or can be purchased at the shop. Slain enemies drop gold based on their worth and your coin multiplier, which resets upon missing a beat or taking damage. There are also secret shops that sell items for blood, challenge, or just for cheap. In a currently flooded indie market, Crypt of the Necrodancer is a diamond among a sea of pearls. It’s a unique and exciting experience that feels totally new, which is something that can be hard to achieve today, especially for a veteran like me. Whether you just played your first rogue-like and you want another taste or you still have your Rockband guitar next to your TV, Crypt of the Necrodancer is sure to put a smile on your face, even if it kills you immediately after.